Please contact us ASAP if interested in this trip. We expect it to fill. We are only accepting 12 attendees for our 2020 expedition. Please register early. All trips start and end in Maun, Botswana. In this life changing safari we experience the ancient art of tracking & bird language with modern-day hunter-gatherers, the Naro Bushmen. We learn of their incredible connection to the Earth by foraging, tracking, and walking with them through the lands of Western Botswana. This is not your typical safari. The philosophy and goals are quite different. We honor and learn from people who have an intimate relationship with the land where they live, learning from the Naro Bushmen in their home of the Kalahari desert. Every day is a unique journey. The first days of our expedition are spent with the Naro. 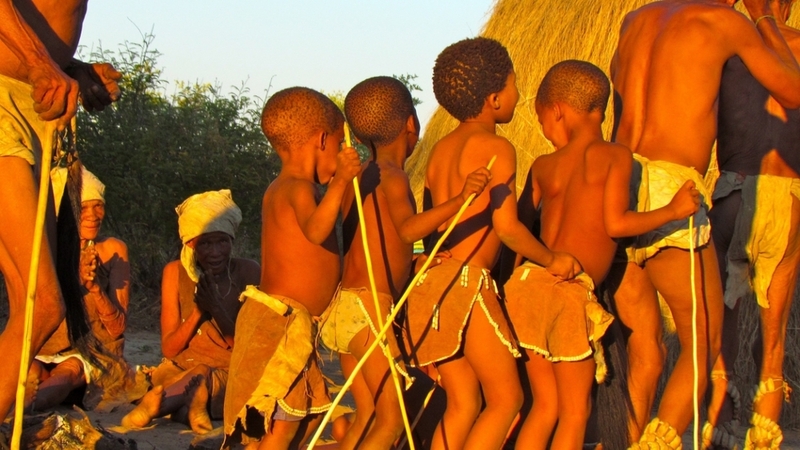 The Bushmen teach and guide us the same way they do with their own children, hands-on learning out in the bush. We also learn bird language and tracking in a context we do not often experience, where these skills are truly needed for life. Awareness, tracking and bird language are ever-present and supported by all members of the community. We participate in food gathering and harvest of medicines. We also learn about hunting, tracking and placing traps along with making rope and fire. The late afternoon is the time to play games extending into the night as we sing and dance around the fire. Some nights we are given the gift of experiencing trance dancing and healing. The second half of the journey is spent in the Okavango Delta, one of the most diverse and wildlife-rich places on Earth. $12,689 (A 50% deposit of $6345 is due upon registration, full payment due January 15, 2020). We put emphasis on the laid-back life of the hunter gatherer. There is no particular order for any activities. When we are with the Naro Community we let their needs lead our activities, making for a more authentic experience. This trip is both a cultural and a wildlife exploration, a place to learn and practice the art of tracking with some of the best teachers in the world. Come join Jon and Nicole for an intimate and powerful journey learning from the Bushmen, the wildlife, the landscape and each other. Jon's experience working with indigenous elders across the world bridges our collaboration with the community of Naro Bushmen. Jon is the author of What the Robin Knows: How the Birds Reveal the Secrets of the Natural World. Jon Young is also featured in the documentary The Animal Communicator, which examines the indigenous roots of interspecies communication abilities and current expressions of this work with everything from pets to wildlife in wild settings. Dr. Nicole Apelian has worked in Botswana since 1995 and wrote her dissertation on the concept of indigenous tourism and cultural regeneration. She is collaborating with a number of Bushmen communities on a medicinal, edible and traditional use plant guide for the Kalahari Basin. She is a teacher of wilderness living skills, a personal wellness coach, and an herbalist. She can also be seen on the History Channel's hit series Alone. To read more about Nicole please visit her personal website at www.nicoleapelian.com. You may read her dissertation here... To learn more about Jon, Nicole, and your other guides please see our staff page. 10-day Trip with Jon Young, Dr. Nicole Apelian & the Naro Bushmen. We will work closely with a special Naro community for the first week of the expedition, before heading off to the Khwai River wilderness to experience new wildlife and habitats. This beautiful area is known for its rich wildlife. Here we see many species not found in the dry Kalahari. These 10 days brings together elements gathered from many prior years by the leadership team. We expect another amazing experience with the Naro in a hunting and gathering setting, settling into powerful exercises developed from the team's repertoire of experiential training and mentoring expertise. Our journey will begin at a lodge in the Kalahari Desert. The owners of this lodge have lived alongside the Bushmen here for 120 years. They have truly succeeded to preserve this piece of land and protect the food sources that have been so crucial to the Naro for thousands of years. The second part of our journey will be spent in the bush near the Khwai River in luxury meru tents. A full compliment of food and beverages is included while on safari. We will have a Naro interpreter with us in the Kalahari. About Family The 10-day journey is open to adults and families with children 12 and over. There is a discount for children who are age twelve. Insurance Basic medical rescue insurance is required. Trip insurance is highly recommended. This trip is expected to fill so please sign up early. Please note Pricing is subject to currency and seasonal fluctuations. An experimental film by Victor Wooten, one of our 2014 trip participants, to provide a way for the 2014 participants to relive our experience and for others to share in it. To view, please press the play button above. Thanks Vic!